No matter how well your storage system is designed and your drivers trained, collisions between your forklift trucks, their loads and your storage racks are inevitable. We encourage our customers to regularly inspect their rack for damage, have a formal rack inspection carried out by an expert at least once a year and to motivate their fork lift truck drivers to report damage. However, rack damage will occur and need rectifying. Any damage to a rack upright will reduce its load carrying capacity. The greater the damage the greater the reduction in its strength until the upright collapses at its normal working load. Damage to bracing sections will reduce the capacity of the racking frames to withstand frontal impacts and may reduce the axial load carrying capacity of frame uprights. To reduce the possibility of a collapse occurring through damaged members, we suggest following the SEMA method of measuring the damage. This will enable you to assess how serious the damage is. Any upright with a tear, split or buckle should be replaced. An upright with a bend in the direction of the rack beam should be measured using a straight edge 1.0 metres long. Placed against the concave edge, the gap between the edge and the rack at the bend should not exceed 5.00mm. See the illustration below. For an upright bent in the plane of the frame bracing the maximum gap between the upright and the straight edge should not exceed 3.0mm. See the illustration. For an upright with damage in both directions deformation should be measured as above and the appropriate limits observed. For bracing members bent in either plane the gap between the straight edge and the member should not exceed 10mm. Where the measured deformations exceed the tolerances the damaged members should be unloaded and the system supplier consulted. Particularly relevant here is the Redirack Sacrificial leg. In 90% of all cases damage to racking frames is restricted to the first 1000mm of the front upright. 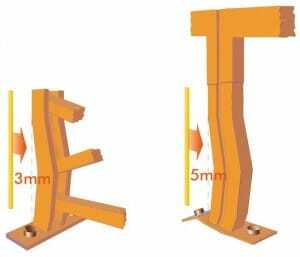 Our sacrificial leg is a removable section in the front upright that can be easily replaced in a fraction of the time that would be needed to replace the whole frame. This reduces the costs and disruption normally associated with rack maintenance. Beams showing signs of cracks in the welds between the end connecter and beam section should be replaced. Beams with end connectors showing deformation should be unloaded and the suppliers’ expert opinion sought. Beams naturally deflect under normal loading. This deflection should disappear when the beams are unloaded. If it does not then it should be measured. If the beam’s residual vertical deformation exceeds one thousandth of the span length then your system supplier should be consulted. Lateral deformation should not exceed 40% of the normal vertical deflection under load. As already stated any rack damage will reduce the load carrying capacity of the system. If you have a damaged component then using these guidelines will enable you to assess the severity of the damage. Maintaining the safety margins of your storage system is critical. For more information on this subject see the SEMA Code of Practice: The Use of Static Pallet Racking.